In the last week of the Parenthood series discussed a subject that is a fear of every parent; what if your child follows a path contrary to how you tried to raise them? How should we react when the decisions our children make are morally and/or spiritually polar opposite to our own values? As a father to two young boys, instilling values into them to successfully navigate life is one of my top priorities. The scary part is, I won’t know if I’ve succeeded until they are old enough to make their own decisions. No matter how “perfect” your kids are now, we can never forget that there is no one righteous (Romans 3:10), everyone is capable of messing up. That is not to discourage us or lower our view of our children, it just keeps us in check with reality. What I am showing in my image, and what parents walking though tough situations with their children can find comfort in is God knows how you feel, take a look at how his children historically relate to him. Do you sense that God is a bit frustrated with His children here? God may have been the first, but he won’t be the last to use an analogy of livestock when it comes to their kids! Bottom line, God knows what it means to parent through pain. How does he do it? Check out Luke 15:1-32, the story of the prodigal son. The father in this parable has lost a son to the enticement of the outside world, with its consequences. Despite abandoning his family physically, morally, and spiritually, the son was received back with open arms when in finally chose to return. In addition to welcoming his son back home, we also see the father was expecting his return. The father spotted the son when he was “still a long way off”, meaning he had to be watching the road, waiting to see that familiar silhouette. The face in my drawing is a face of discouragement, disappointment in the current state of things, regret over past decisions (or missed opportunities). I drew the face vaguely enough that it could be perceived as an adult or a child, as both experience similar emotions when choices separate them. 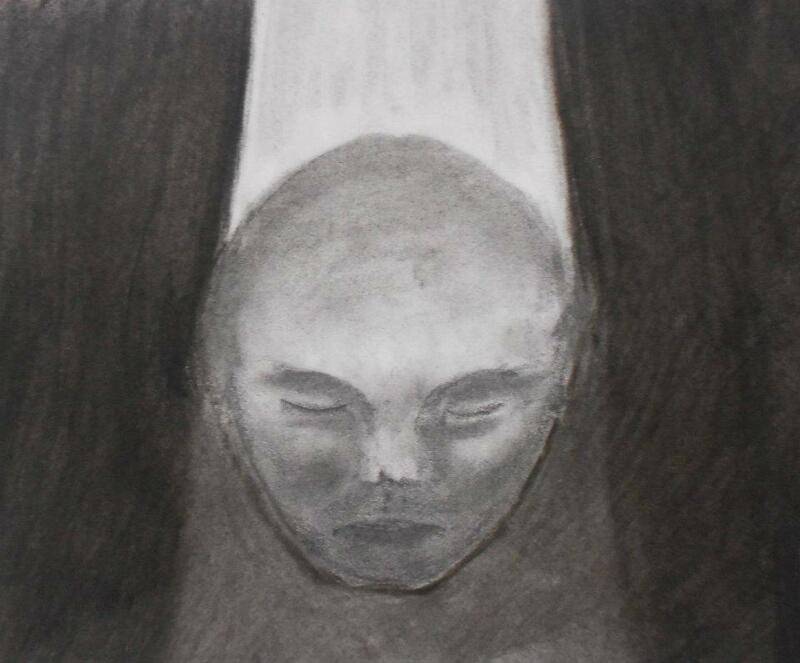 The weight of the blackness around the head adds to the heavy emotion in the face.